A few weeks ago, we had an opportunity to visit Asheville North Carolina and meet some of the awesome brands that call the area home. Now, we're here to tell you the story of an epic weekend with fantastic new friends. When we go out into nature, sometimes we tell ourselves we are trying to get away from it all. Away from the hustle and bustle; away from people. When in all reality, we aren’t trying to escape people; we are there to find refuge with other people who are like us. People who are out having an adventure. People who share the same vision of fun. People who are out to achieve a similar goal. It’s a goal of success that may not have a defined metric, but is defined by nothing more than a feeling of community. There’s a community you may have never heard about focused around a little place in North Carolina called Asheville. Now, if you’ve heard of Asheville, you’ve likely heard of it for it’s craft beer scene or maybe it’s music scene. Perhaps you’ve heard of it as a new mountain biking mecca. Maybe you’ve heard of it because of the proximity to some of the best hiking and paddling in North America. But here’s something you may not know: a new, different type of community is flourishing. 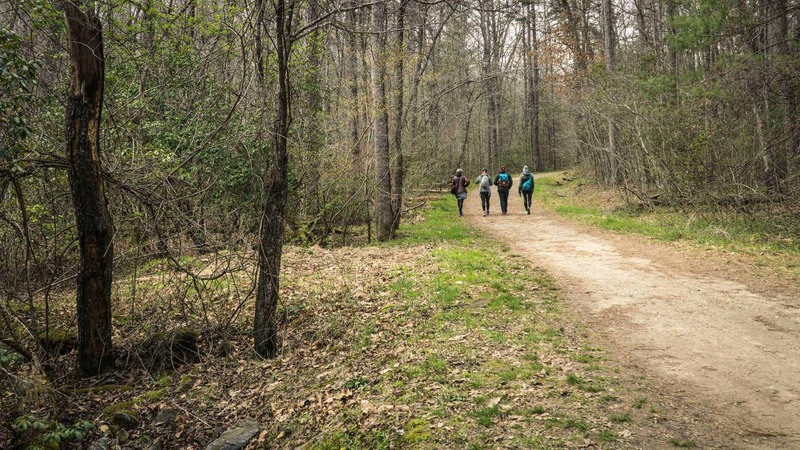 This community is the North Carolina Outdoor Gear Builders’ Association. 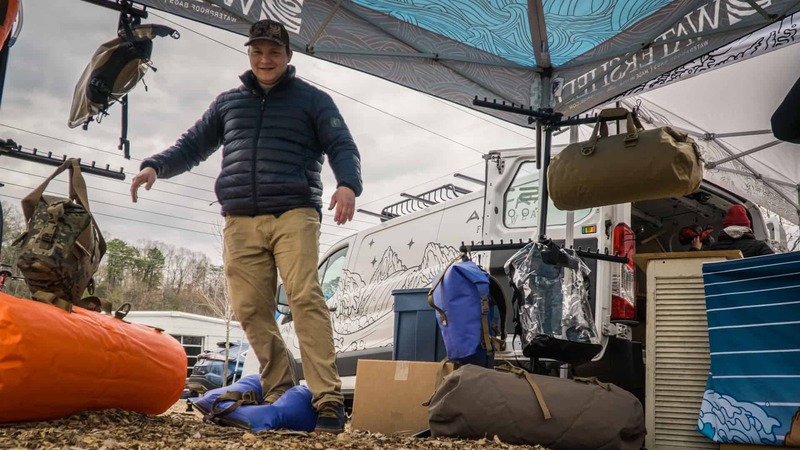 This community is responsible for local craftsmen and women being able to put their talent to work within the the outdoor industry creating some of the best gear around that is either made in or headquartered near Asheville. 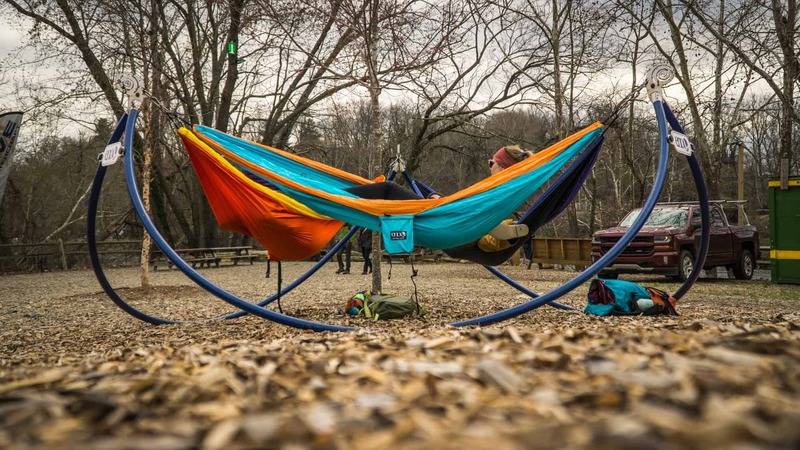 Hammocks, merino wool socks, camp chairs, tents, and drybags are just a start. 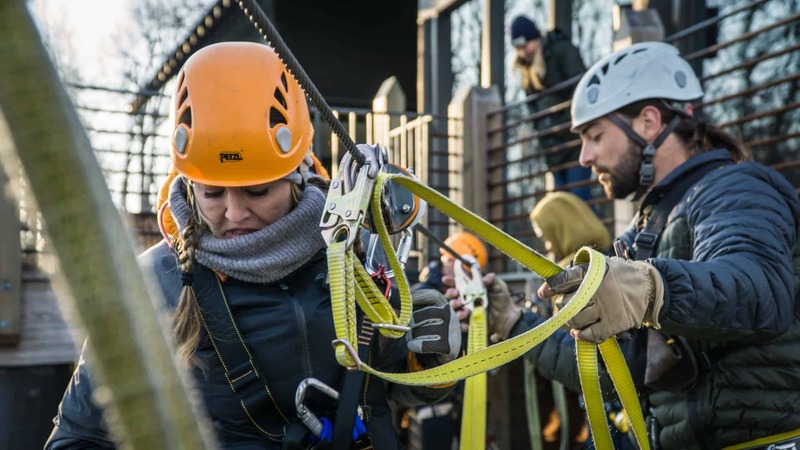 In an era of high rise headquarters and outsourcing to the cheapest bid, these companies are staying true to their motto; “Extraordinary Gear Made Here”. 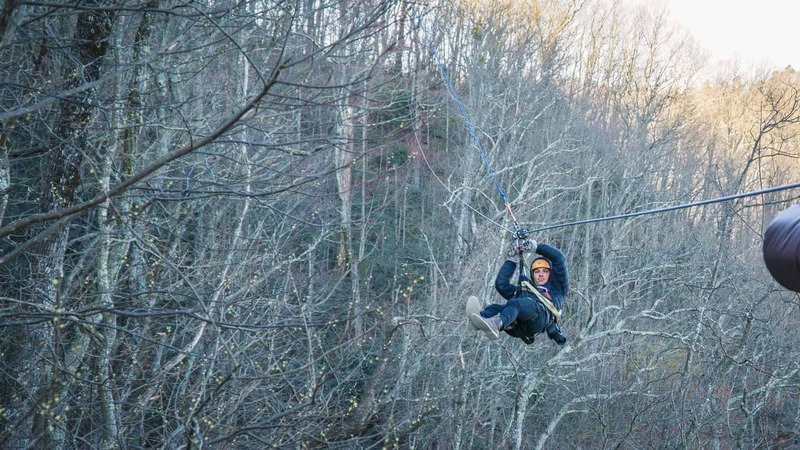 Our trip to Asheville was unlike any other that we’d taken before. 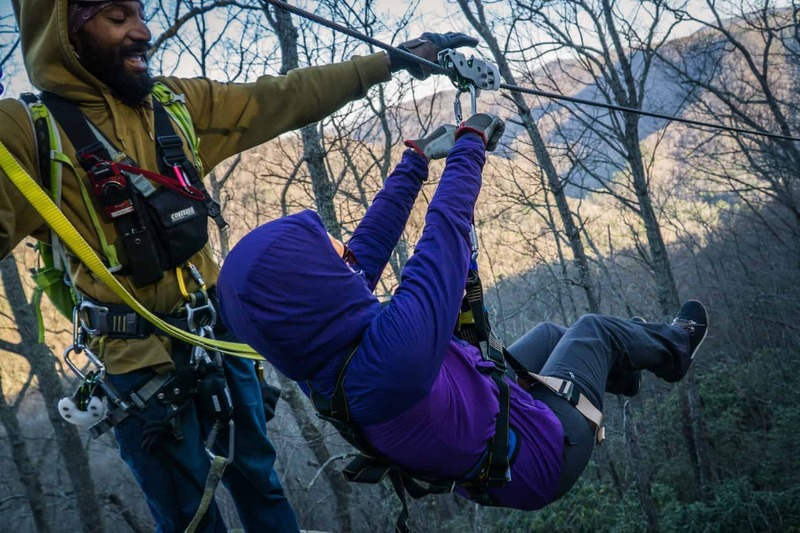 We were invited on this press trip to meet and mingle with the local companies and gear makers of the northwestern region of North Carolina. Our expectations were, well, pretty nonexistent. We had no idea what we were getting into, but we were up for the adventure. So we headed to Asheville with open minds and empty memory cards. It was pretty apparent on our first day that this was going to be an incredible trip. Rather than stuffy journalists and businesspeople getting together over a conference table, we immediately jumped into drinking beers and telling tall tales. The group of businessmen and women, the journalists and media blurred together as friends in an instant. That evening, we mingled with the folks from different media outlets as well as the owners and creators behind the gear made right there in North Carolina. The stories and camaraderie continued over craft beers well into the night before we headed back to the hotel to rest up for our big day starting the next morning. We awoke the next morning to a fantastic breakfast at the hotel while getting a briefing of the day’s events. We were in for quite the day, so we needed to fuel up. On the menu: taco scrambles. 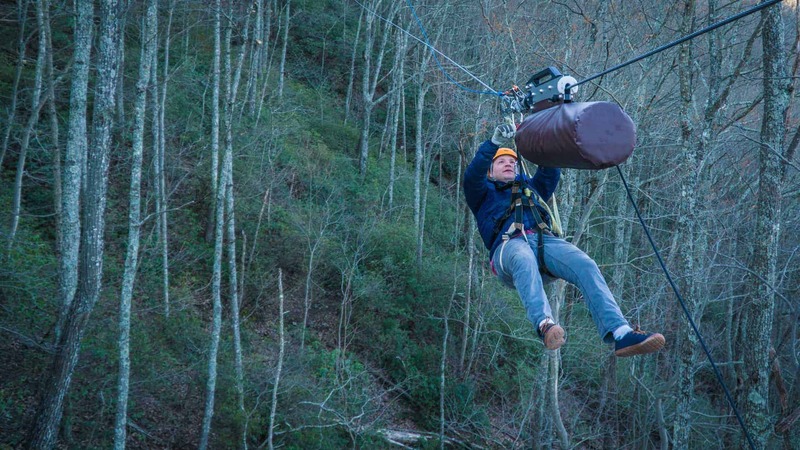 Loading up and heading down the road, we took ‘jumping into things’ to a whole new level, as we ziplined through the Green River Gorge. 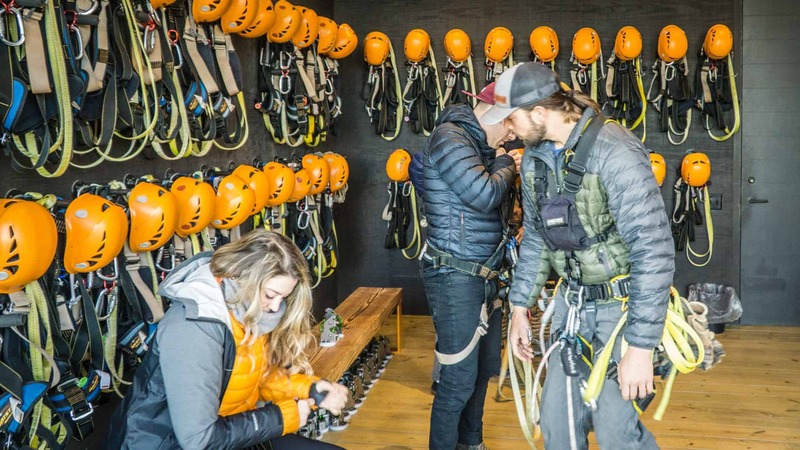 The guides from The Gorge showed us the ropes, literally, and we took a leap of faith before zipping down America’s fastest, steepest zipline through the breathtaking canopy of the Green River Gorge. Even though the trees hadn’t quite awoken from their winter slumber, the views were spectacular. I can only imagine how breathtaking this would be in the fall. After zipping through the trees, we had worked up quite the appetite. Back at the basecamp of The Gorge, we were pleasantly surprised to see a lounging area set up by Blue Ridge Chairworks and Eno Hammocks, which overlooked the area we had just zipped through. Even more pleasantly surprised – they had fully stocked the lounge area with craft beer (among other beverages). We were really starting to see the craft brew pride in Asheville! Lunch was brought in by The Purple Onion and we continued to relax and mingle as we ate. And what better way to reward yourself after a long (or short) hike, than – you guessed it – some craft beer! The Meet the Makers Happy Hour at Catawba Brewing allowed us to mingle with even more of the folks who make Asheville great. 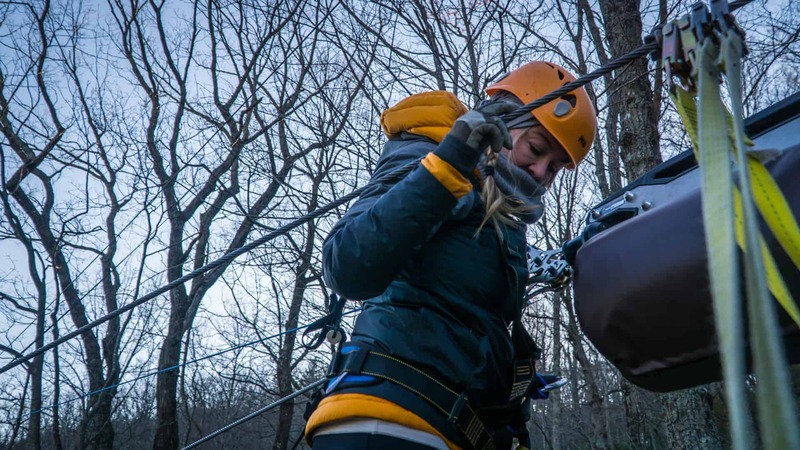 From city leaders to outdoor companies to companies that support the outdoor community, there was quite the turnout of incredible people of Asheville. 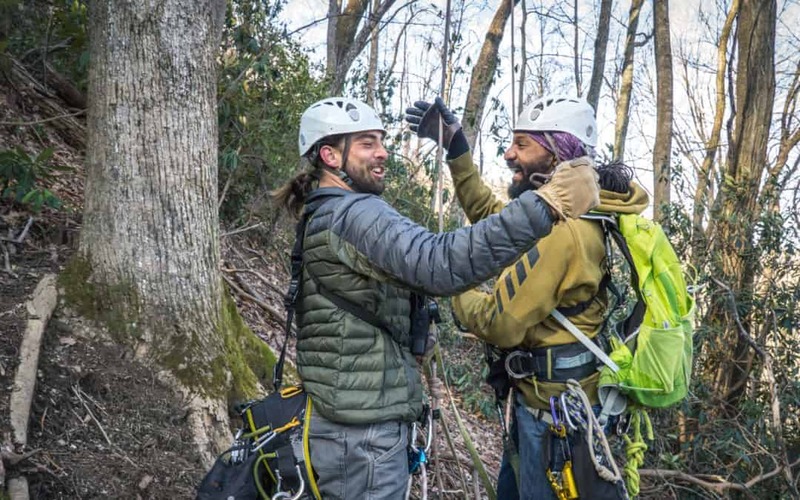 Listening to the speakers who addressed the crowd, we learned a lot about the community that has come together in Asheville to really bring outdoor recreation to another level. It was eye-opening to see the work that has been put into this community and how each person and company has banded together. We got to really start seeing the personalities shine from the makers of this gear that we had been learning about all day. 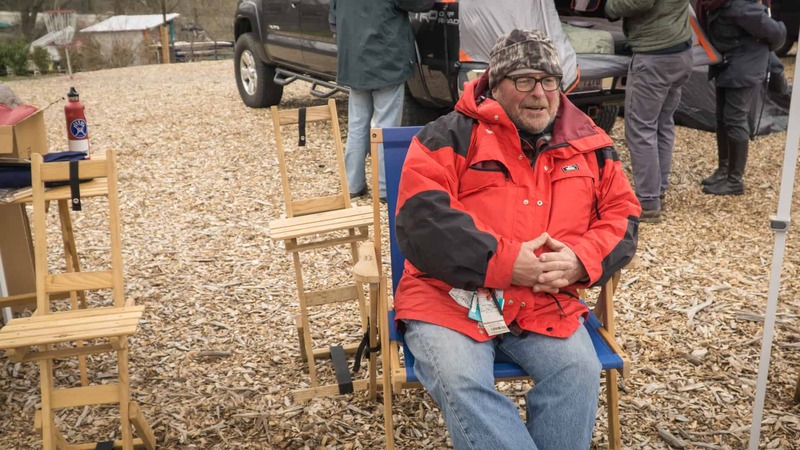 The pride on their faces and the light in their eyes truly made us feel the passion they had for the outdoor community and their part in that community. We continued our conversations about community and gear over tacos for dinner, before turning in for the night back at our hotel room. 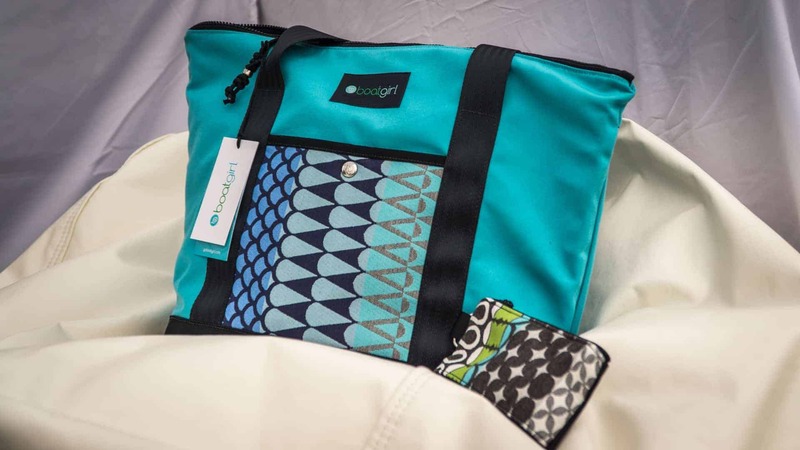 Bikes and Drybags and Socks, oh MY! Day two kicked off after another fantastic breakfast with some mountain biking at Kolo Bike Park in Asheville. Before the ride, though, we got a demo of Farm to Feet socks, merino wool socks that are circular knitted so they don’t have a seam at the toe box. 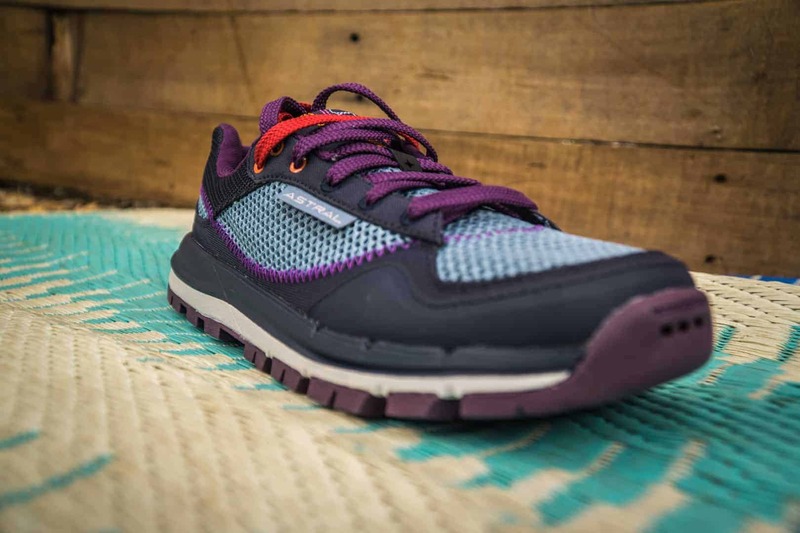 While we’ve been wearing Farm to Feet socks for a couple years now and love them, it was great to see the new products and technology they’ve put into their socks recently. Though it had been raining in the morning, the skies cleared up for just long enough for us to get in a short bike ride through the park. Luckily, we had our Watershed Drybags with us as well, which clip perfectly on the handlebars of the bike to keep our gear dry and clean through that muddy ride. Since it was raining and quite cold out, we headed over to the UNC Asheville pool for a demonstration of Bellyaking. What’s Bellyaking, you ask? Well, you may want to check out the video above for a better representation. The concept of Bellyaking was thought up by Adam Masters, who grew up in a community of kayakers and whose father founded Perception kayaks. 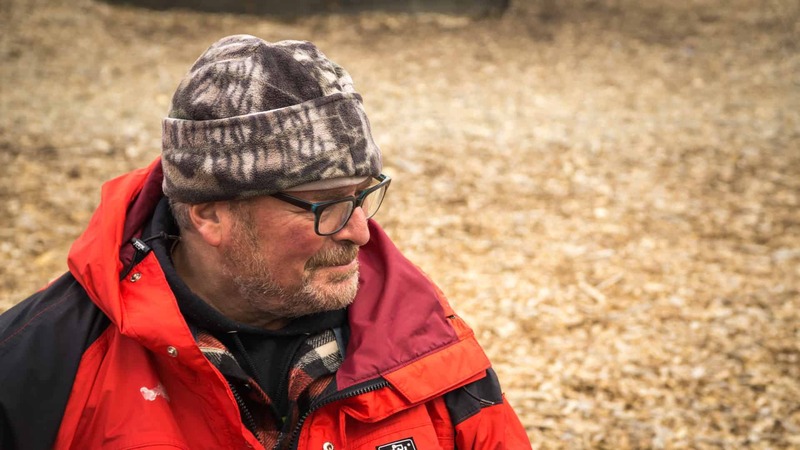 Seeing the challenges and dangers that come along with kayaking, and even losing some good friends to kayaking, he decided to create an alternative to the sport. By cutting up and reshaping some old kayaks, Adam created a whole new sport. Lying on your belly rather than sitting on top of the boat, bellyaking provides greater stability from the very getgo. Using your hands as paddles, you feel much more in control of the boat. Each of us was even able to learn to roll the bellyak within just a few tries – something we were never able to truly master over a year of practicing on a kayak. Ultimately, there’s less of a learning curve and lower consequences to bellyaking than to kayaking, making it a fantastic watersport for almost anyone. 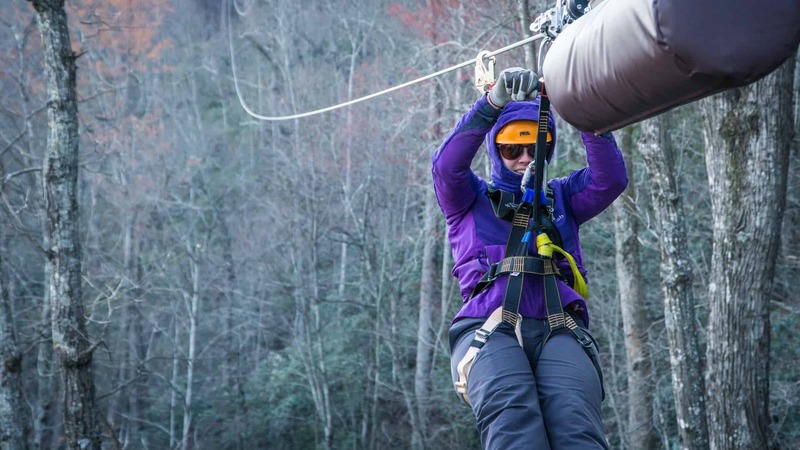 Our final adventure of the weekend was the Get in Gear Fest in Asheville. A gear show centered around the brands of North Carolina, Get in Gear Fest is open to the public and allows people to get hands on with some new gear and ask the reps of each company any questions they may have about the gear. 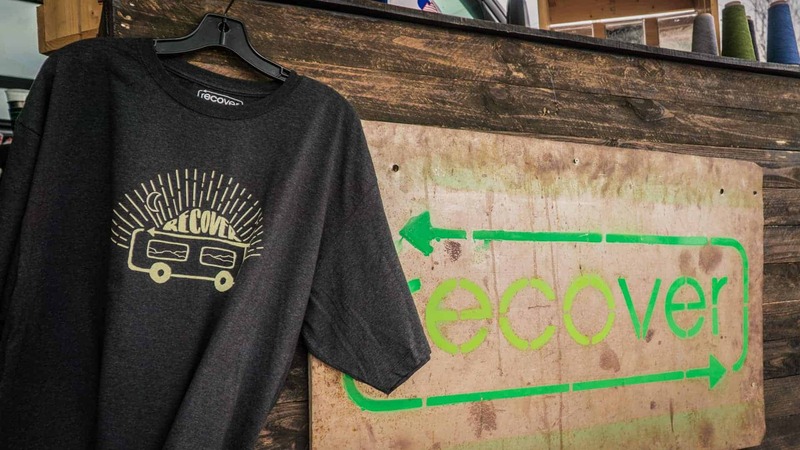 While many of the brands we had met over the weekend were in attendance, like Recover, who makes their apparel out of recycled plastic bottles and recycled cotton, there were several other companies that also made appearances. Again getting to see the community in the Asheville and western North Carolina region gave us a great idea of the special bond this area has created. There is no greater strength than a community working together for a common purpose. Community is an interesting word. It is defined as a unified body of individuals with common interests. Oftentimes, people think of a community as the place they live and the individuals they interact with regularly. We think of it differently. Our community has grown over the last few years to include amazing individuals from all across the globe. Being travelers, we don’t have a place of residence that forms a sort of built-in community. We’ve sought out our community piece by piece, and we continue to grow it every day. 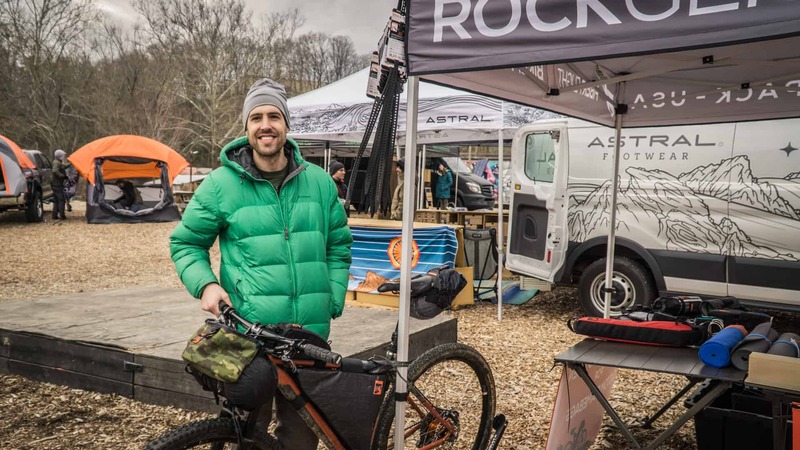 Similarly, the gear builders that we met in Asheville have built their community piece by piece, everyone with a common goal: to build their local community into an outdoor hub for all types of recreation. While we may be a little biased after this trip, we think they’ve done an extraordinary job at accomplishing that goal.